The Kirk PZ-141 Camera Plate for Nikon D7000 is a quick release plate that's designed specifically for the Nikon D7000. Its dovetail fits Arca-Swiss-style clamps to enable a quick release from a tripod head. The plate is machined in the U.S. from 6061 T6 aluminum, and it includes a stainless-steel Allen screw for attaching it to the camera. Two additional screws serve as safety stops; in case the clamp is inadvertently left loose, the smaller screws will help stop the camera & plate from sliding all the way off the head. The PZ-141 plate features a sensor-centering line on the side. Two Allen keys are included with the camera plate. 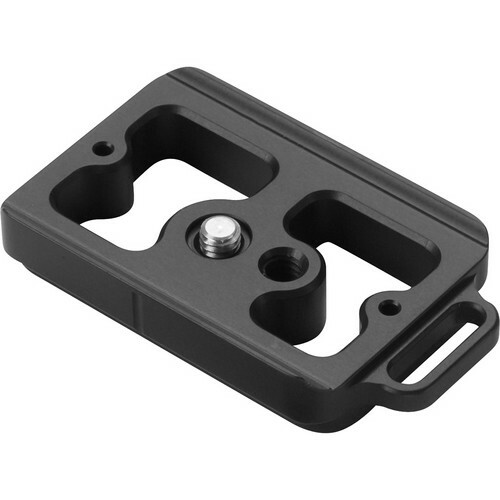 Box Dimensions (LxWxH) 5.0 x 2.9 x 0.4"
PZ-141 Camera Plate for Nikon D7000 is rated 4.7 out of 5 by 11. Rated 5 out of 5 by Greg from Well designed and machined, fits perfectly. Precision machining is evident. No sharp edges or burrs on any surface. Excellent finish. Plate will not twist around the mounting screw due to the lip that hugs the camera body at its base. Mates to a non-Kirk Arca-style QR clamp on my tripod ball head securely. I have several Kirk plates and clamps and a lens collar, and they are all first rate. Rated 5 out of 5 by Sabugosh from Perfect fit I was surprised at how light this piece was. Contoured to fit my D7000 snugly, this plate has the benefits of Arca-Swiss clamps compatibility. I have a Kirk quick-release plate on my Studioball for which this plate is made for and it works just as intended. It comes with Allen wrenches (2) and safety stops (2), once attached properly, it does not move. Rated 5 out of 5 by pictureted from If you use Arca Swiss - this is the best I'm a big fan of Arca Swiss quick releases and have them on all my tripods. I don't like L-plates, since they're quite a bit larger and bulkier. I also have several lenses with collars that rotate. This is a perfectly made, light-weight but sturdy plate up to Kirk's exemplary standards. Rated 4 out of 5 by brokir from PZ- 141, perfect fit I have this mounted to my D7000. Fits perfect. Allows me to use a hand strap and mount to my tripod with ease. Only thing keeping it from being 5 stars is the price. It is priced a bit high, but is a fine plate. You will not be disappointed. Rated 5 out of 5 by Robert T. from I Have One on Each of My Camera Bodies! Kirk plates, whether for camera bodies or lenses, are extraordinarily well-made and do exactly what they are intended to do. They are Arca-Swiss compatible as well as compatible with Kirk's ball heads. Great product! Rated 5 out of 5 by Anonymous from great fit and quality. great quality and fit. no slipping. have my Op/tech sling strap attached to it as my only connection to camera. very secure! Works great with my RRS quick release clamp. Rated 5 out of 5 by Francis from Perfect for my D7000 I've started using a tripod and ball head. This plate makes everything work perfectly together. Rated 5 out of 5 by Mburgcu from Excellent quality Custom fit with battery grip with built in camera strap loop. Solid built last forever.